Unless you're Usain Bolt, the physical action of putting one leg in front of the other lacks excitement. Striiv's Smart Pedometer provides the motivation we all need, setting challenges and allowing you to compete with friends, all while getting fit — Lifehacker readers can currently get 40% off. 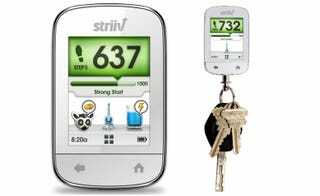 Much like Fitbit or Nike+, Striiv's Pedometer provides in-depth metrics for your daily activity, but Striiv's killer feature is its apps; you can take on your buddies in races, see how far you've walked up a virtual Mount Everest, quantify the calories you've burned in cupcakes, or raise money for charity.